6/10/18 – Lovely Badger has found a home! 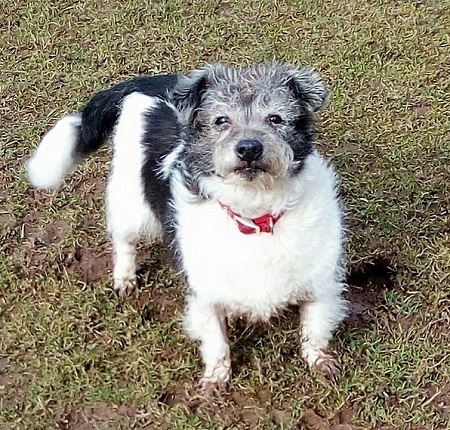 Badger is an 11 year old female Terrier Cross who is being rehomed by Wonky Pets Rescue and is a foster home in Swadlincote, Derbyshire. Badger is such a little sweetheart, a really happy, loving girl who adores attention and will make a great companion dog. She needs a quieter home, ideally as the only dog, as although she is good with other dogs out and about, she doesn’t really like them near her bed in the home. She will happily trot along with other dogs on a walk but likes her own space indoors. 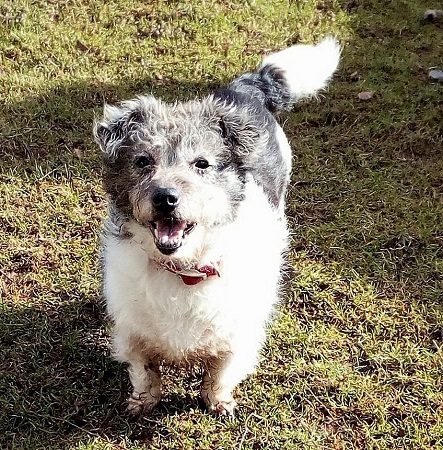 Badger needs an owner who is fit and active enough to take her for a couple of good-length walks each day as she loves going out. She also loves having company so would suit an active early-retired home with someone around a lot of time. She will need a home with a nice garden that she can potter around in. Badger would be fine with sensible children aged 5 and over who are respectful and won’t pull her around. She is not bad with dog-savvy cats. Badger is clean in the house and travels OK in the car once settled. She is spayed, microchipped, flea and worm treated and has had a dental. Could you offer Badger a new place to call home? Please say that you saw Badger on the Oldies Club website.